How to Prepare for NEET 2018 without Coaching (Self Study) – It has become a norm nowadays for parents to enroll their children to coaching classes for engineering and medical entrance examinations. The majority of students too want to take the help of coaching classes to crack these competitive exams. However, maybe you are one of those candidates who want to crack NEET exam without the help of coaching classes. And it might work out extremely well for you depending on your patience and determination. Some people tend to think that higher the fees asked by a coaching class, the better chance the students would have to crack the exam. Scoring good marks in exam depends entirely on the teacher’s method of teaching and his/her dedication to teaching. Follow the points listed below religiously to crack NEET exam through self-study. 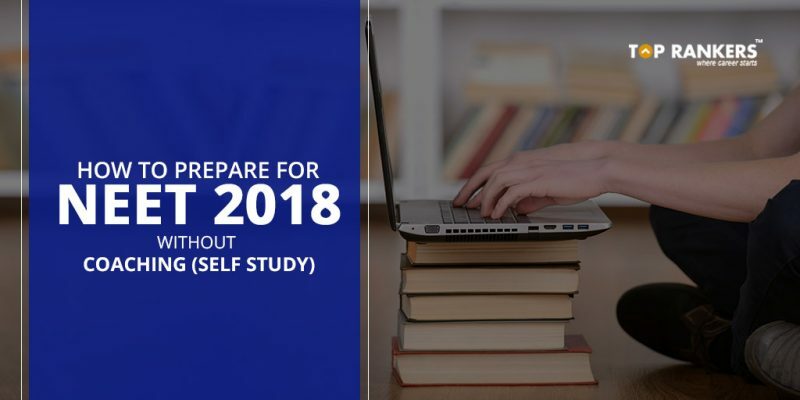 To crack NEET exam 2018 without taking any coaching class, you have to prepare a daily study plan for yourself. And allot a fixed number of hours to each subject daily. Follow this plan strictly; and do not forget to include breaks and time for recreational activities. These activities refresh your mind and helps you prepare better. However, this does not mean that you spend the majority of your time on other activities and breaks. Spending 6 hours daily is a recommended time duration for study. Divide this into three intervals – of 2 hours each of continuous study on a particular topic – with a break of fifteen minutes in between. Taking a break longer than 15 minutes has the possibility of distracting your mind. And you may abandon the idea of studying for the day. Yes, we completely understand that. So, never take breaks longer than that. But do keep in mind that you may decrease or increase this recommended study duration according to your capacity. Going overboard will tire you out and you won’t be able to concentrate; this will degrade your preparation. A wise decision would be to ask the toppers or experts in the field for their suggestions regarding the same. 3) Mock Test is the Key! You need to practice regularly to understand the concepts better. It helps you retain your memory of the concepts. Also, it helps you manage your time efficiently as it lets you know the exam pattern and time allotment. You can effectively increase your speed to your advantage by giving mock tests. The mock test result will help you in analyzing your performance. Accordingly, you can focus more on your weak areas and improve. With this style of preparation, you can study as per your choice of time and convenience. Eventually, it keeps you away from stress. 3) Do not skip sleeping. You should sleep a minimum of 8 hours daily to keep your body and mind refreshed. Also, consume healthy food at proper times daily. 5) A mistake that many of us commit – studying on a bed. Always study on a desk-table or chair-table arrangement. It helps you to concentrate. Did you find our post on How to Prepare for NEET 2018 without Coaching (Self Study) helpful? Keep visiting our website regularly for more preparation tips and strategies.